The Rexel RES1223 provides general security with effective 4.8mm strip cut shredding. 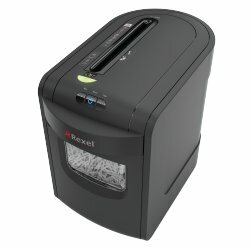 Featuring revolutionary Jam Free Technology, this shredder automatically alerts the user when trying to shred too many papers in one go. This shredder accepts 12 sheets (80gsm) or 13 sheets (70gsm) of A4 paper and an easy to empty 23 litre pull-out bin which takes up to 190 sheets. The self sealing waste paper bag, which is included, makes recycling easy and it is eco-friendly. Finger safe for additional safety (UL60950). There is also an overheat protection function - the thermostat detects when the shredder overheats and automatically goes into cool-down mode for additional safety. The high performance steel cutters are durable for continuous use. LED Electronic display keeps you in total control.